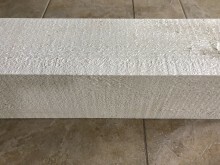 Our rough sawn beams are hollow and come in either three or four sided versions. Being hollow, they cost much less than solid wood beams and are much lighter and easier to install. Rough sawn pine beams are ideal for making exposed roof trust or exposed ceiling rafts. We offer all the components you need including: the top and bottom chords with or without finsihed ends; web beams; corbels for the supports, faux metal strapping; and even decorative metal gabel plates. Pine beams are pre-assembled with interior bracing prior to shipping. 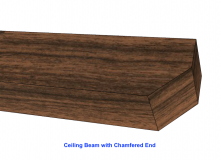 We inspect each beam to ensure a rustic look but avoid any split or warped sections. The stain is hand wiped and inspected to insure a consistent colour throughout the beam. Much more items will be introduced in January 2019, samples of various sizes and colours will be also available to order.